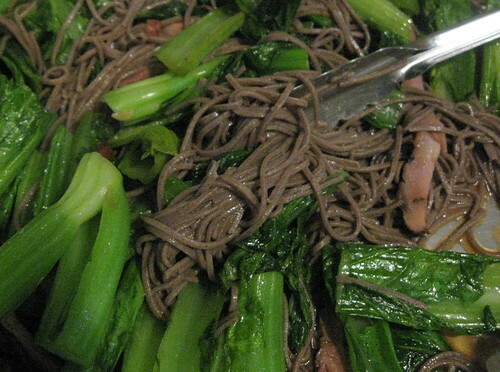 Soba noodles, greens and pork, originally uploaded by Seligmans Dog. Crestview (corner of Crestview and North High) is on my way home and my new favorite stop on the way home. It's a typical crammed Asian market and the value of it, I'm finding, is in the details. The other day I had an itch to make a dish that was fast, used leftover freezer meat, and was healthy. Greens and grain is a biggie on our menus and I decided it would be greens, soba noodles and some of the vacuum wrapped, grilled pork loing that had occupied the freezer for months. I ran in Crestview and had decided a simple, quick wilting bok choy would be a good green. I picked up one of the many types of greens there, my soba noodles, ginger and sprinted home to start a nice meal. peanut and sesame oil, shaved garlic and ginger, sauted some sliced frozen pork loin, then tossed in greens, soy (2T) and 1/4 C water (the pork was grilled and had a lot of flavor), and let the greens steam a bit. While that was cooking, I cooked the soba in salted water for about 4-6 minutes, strained and tossed all to heat. Really fast, healthy and very satisfying. Spend some time in Crestview's small produce area. It's got more than you might think. the live swimming fishes could be a good kid distraction too..
How did I forget! They also had frogs that last time I was there. Fun watching indeed.